Before we start using the Guillotina API, let’s get us some test data to play with. Using the testdata command, we’ll populate our database with some data from wikipedia. You can use whatever you’d like but this training will mention use of Postman. 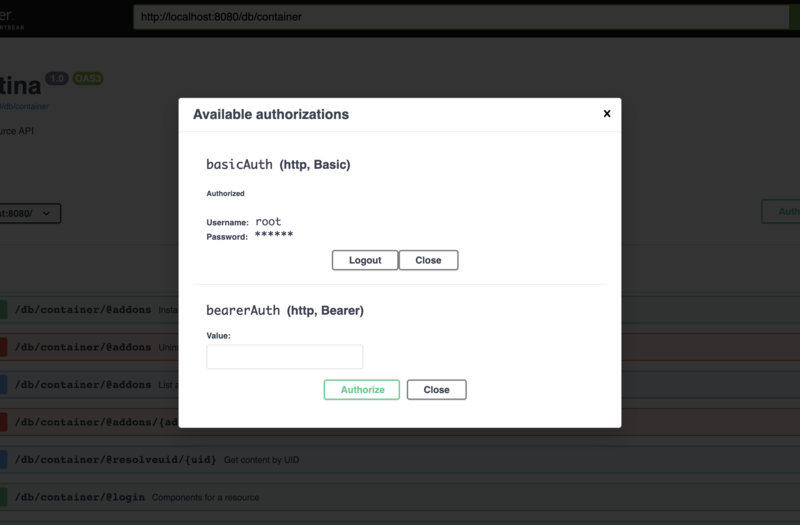 Open up Postman and do a GET on http://localhost:8080/db/container with the username root and password root for basic auth. We can not necessarily go over every single API but will touch on a few and give a general understanding of how to explore and use the API. To create content, do a POST request on a container or folder object. To add a dynamic behavior, we use the @behavior endpoint. Simple file uploads can be done with the @upload endpoint. Then, to download the file, use the @download endpoint. Guillotina also supports the TUS protocol using the @tusupload endpoint. The TUS protocol allows you to upload large files in chunks and allows you to have resumable uploads. Guillotina’s TUS implementation has support for the Upload-Defer-Length header. This means you can upload files with an unknown final upload size. In order to implement this correctly, you will need to provide the Upload-Defer-Length: 1 header and value on the initial POST to start the TUS upload. You are then not required to provide the UPLOAD-LENGTH header. Then, before or on your last chunk, provide a UPLOAD-LENGTH value to let TUS know the upload can not finish. Guillotina’s TUS implementation also attempts to prevent simultaneous uploaders. If two users attempt to start an upload on the same object + field at the same time, a 412 error will be thrown. Guillotina tracks upload activity to detect this. If there is no activity detected for 15 seconds with an unfinished TUS upload, no error is thrown. To override this, send the TUS-OVERRIDE-UPLOAD: 1 header. The @sharing endpoint is available to inspect and modify permissions on an object. To modify, we use the same endpoint but with a POST. In the previous step, we installed guillotina_swagger. 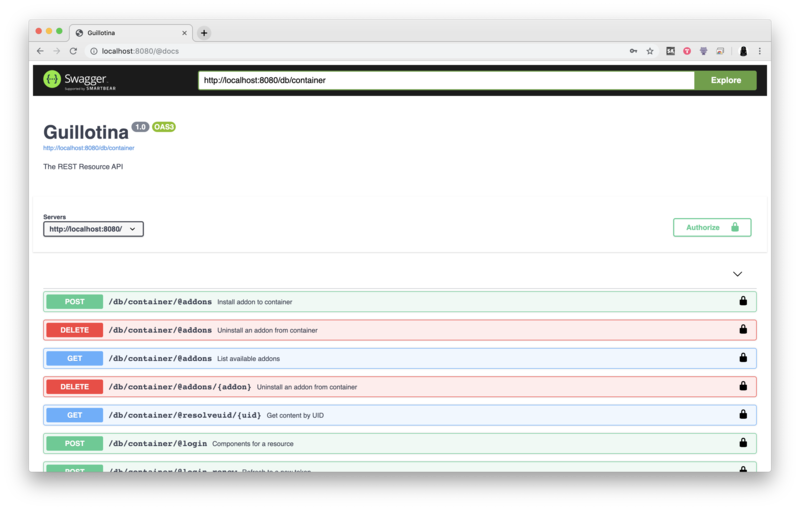 With Swagger, we can inspect any context and explore the API. The Base API Endpoint setting is what the current context is that you’re exploring on. If you create content at /db/container/foobar and want to explore that content’s API, you should change the URL. Different content types will have different services available.